One of the beacons of the IPL and cricket worldwide, AB de Villiers is one player who is loved by everyone wherever he plays. Someone who lives and plays by the true spirit of the game, De Villiers' 360-degree range of shots can overcome any possible variation from the bowler. Apart from being a terrific batsman, ABD is also a fantastic fielder and a great athlete. He has played many memorable knocks in the IPL and has hit several huge sixes, even sending a few literally out of the stadium. Considering De Villiers' abilities, he's bound to have pushed a few names down the record books over the years. Let's take a look at 4 records held by him in the IPL. De Villiers is a team player and has formed a special bond with Indian captain Virat Kohli as the duo play together for Royal Challengers Bangalore. The South African complements his partners very well, and also is very quick between the wickets. He has been involved in the two highest run-yielding partnerships in IPL history. And both of the two partnerships were with Kohli. The biggest one was against the Gujarat Lions in IPL 2016 when the duo put on a 229-run stand after opener Chris Gayle was cleaned up by Dhawal Kulkarni. Kohli and ABD made the Gujarat bowlers dance to their tunes, as no bowler other than Ravindra Jadeja could escape unscathed. 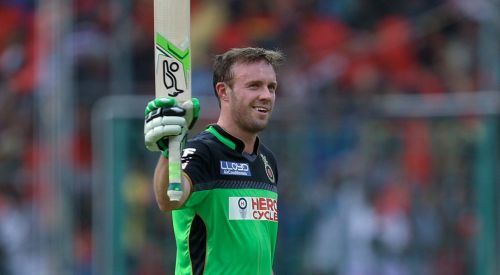 De Villiers struck 12 sixes and 10 fours on the way to his 129 runs off 52 balls, at a strike-rate of 248.07. Kohli meanwhile scored 109 off 55 balls and was dismissed when the team's score was 248/1. Gujarat came nowhere near the target of 249 and a Chris Jordan special ensured that they were bundled out for 104, breaking the record for the highest margin of victory. The second one came against Mumbai in IPL 2015 where ABD scored 133 off 59 balls while Kohli scored 82 off 50 balls. 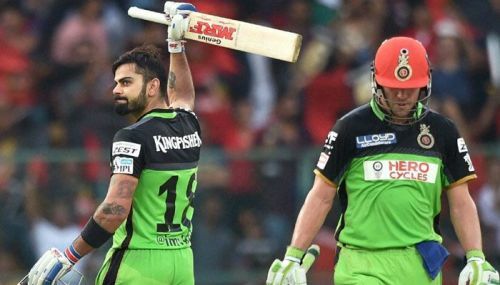 The unbeaten partnership of 215 runs took the match away from Mumbai as RCB posted a gigantic total of 235 on the board. Mumbai gave a tough fight led by Lendl Simmons but fell 39 runs short.